Have a delicious, thirst-quenching bowl of barley soup! 1. Boil water and barley seeds for 15 minutes. Keep flame low. 2. 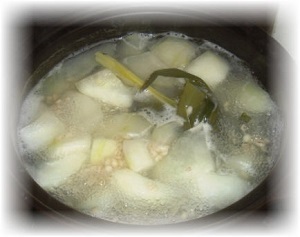 Add the melon cubes and pandan leaves and continue to cook for 15 minutes. 3. Leave the soup to cool. 4. Add honey before drinking. End of "Barley Soup Recipe Rids Heatiness". Back to "Mouthwatering Honey Recipes"